I’ve been a bit quite on the blog front over the past few weeks. I have been shooting more freelance work for the magazine but as the magazine is not published yet, I cannot post these pics on the blog as yet. I will also be posting a few more landscape photographs of Wellington’s South Coast (fingers crossed, hopefully this weekend) once I have gotten around to editing them. Sadly my laptop is old and very very slow and struggles to run Photoshop at the best of times. I think you can judge the age of a laptop by its uniform thickness. Mine is a good inch and a half think all the way through, baby. So it’s pretty old! Hopefully in the coming weeks I should be able to afford a laptop upgrade (woohoo!). 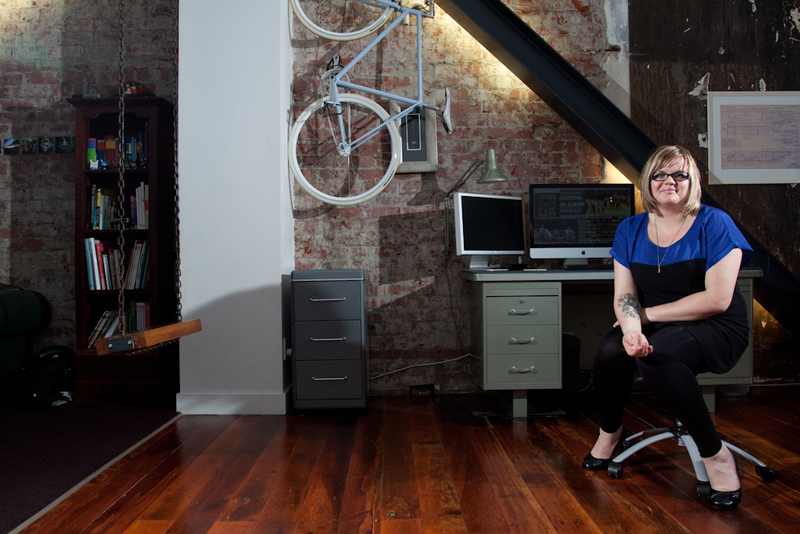 Twenty-four-year-old Bailey McCormack poses for a portrait in the office where she works as a media broadcast monitor. McCormack, who studied theater and politics and Victoria University, adopts her burlesque persona, Fanciforia Foxglove, when she gives performances at the likes of Carousel Cabaret and Dr Sketchy, at Mighty Mighty. ACC Insurance Risk manager Shelly Wilton is chairperson of the Richter City Roller Derby league and plays for Wellington-based team, Comic Slams under the pseudonym, Heidi Contagious. Director of The Office of Ethnic Affairs at the Ministry for Internal Affairs, Mervin Singham, masquerade’s as an expressionist, abstract painter during his spare time. 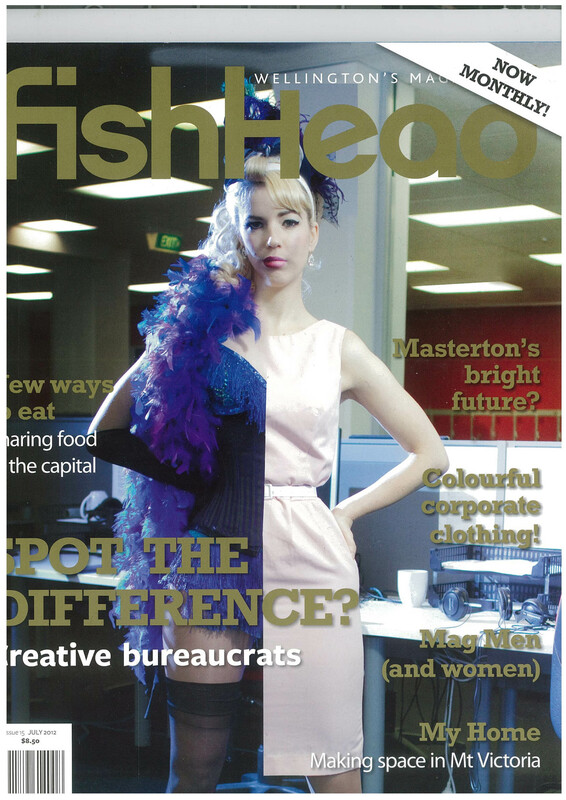 Here is some more work I have recently done for the local, Wellington based magazine Fishhead. Sadly I haven’t had much time lately to work on my own projects but hopefully that’ll be changing very soon. Starting in a few weeks in fact, with a road-trip around New Zealand’s South Island. This work was commissioned towards the end of May. The article was based around the idea that many people who work mundane and tedious office jobs (bureaucrats), have interesting hobbies or persona’s outside of their working life. The brief was to photograph the chosen subjects in their place of work (sadly this wasn’t possible for all of them as organisational politics got in the way), wearing both their normal working attire, and clothing and props which would be representative of their outside interests. The images would then be split vertically down the middle and blended using Photoshop to produce a composite half-and-half image. I had never attempted any shots like this before, and after mulling over the technical aspects and logistics of creating these images, I decided to also include a “rescue” shot, just in-case the split composites, for whatever reason, could not be blended to produce a pleasing and convincing image. For the blended split composite photos, the subject had to position his or herself in the exact same position. This is something that masking tape under the shoes and the camera view screen helped to solve. Things I failed to consider however, were the difference in reflectivity of the two different changes of clothing; the subject or subjects relatives moving items which are in the shot between takes; changes of shoes/roller-skates having a large height difference (this was partially solved by using small Lego blocks under the heel!). The rescue shots involved photographing the subject in their two different outfits, in different positions in the same scene. This is pretty straight forward to do assuming you don’t accidentally knock the tripod. First up we have the lovely and talented, Bailey McCormack. By day an employee at an unnameable media monitoring firm, by night, the foxy Fanciforia Foxglove, burlesque performer. Have to admit, Bailey was cool to work with and I hope to do some more shoots with her in the future. Twenty-four-year-old Bailey McCormack poses for a portrait in the office where she works as a media broadcast monitor. McCormack, who studied theatre and politics and Victoria University, adopts her burlesque persona, Fanciforia Foxglove, when she gives performances at the likes of Carousel Cabaret and Dr Sketchy, at Mighty Mighty. Believe it or not, Bailey had to hold her breath for the full 3 hours that these photographs took. That corset was pretty darn tight. Here are Bailey’s photographs which were used to produce the split composite image. Sadly my Photoshop skills do not stretch that far, so the image blending and final editing was completed by the magazine’s designer. Here’s a scan of the blended shot which appeared in the magazine. Hopefully you get the idea. Below are the split composite images of Bailey, some of which became the image for the magazine cover. Here is the blended split composite images of Bailey. Next we have Shelly Wilton who works as a manager at ACC during the week, and plays for Wellington Richter City Roller Derby team Comic Slams, as persona Heidi Contagious at the weekend. This was shot at Shelly’s home as I was not given permission to photograph at her office. 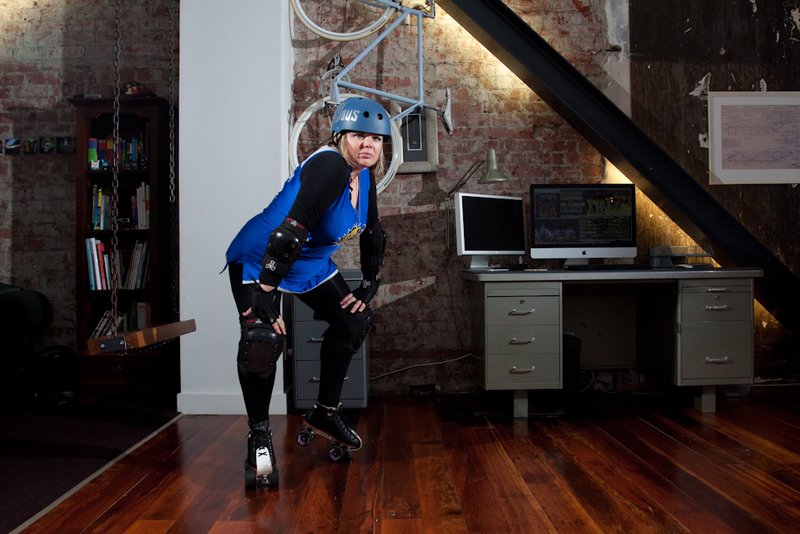 ACC Insurance Risk manager Shelly Wilton is chairperson of the Richter City Roller Derby league and plays for Wellington-based team, Comic Slams. Here is the blended composite of Shelly. 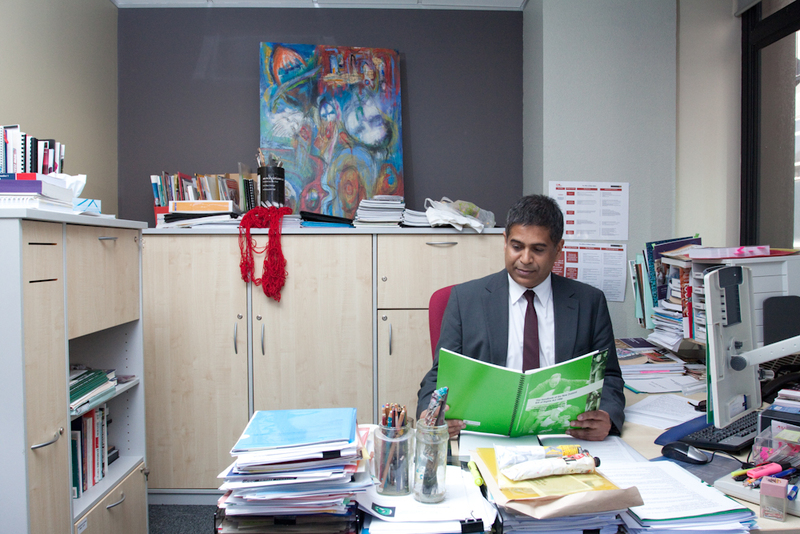 The final subject is Mervin Signham. 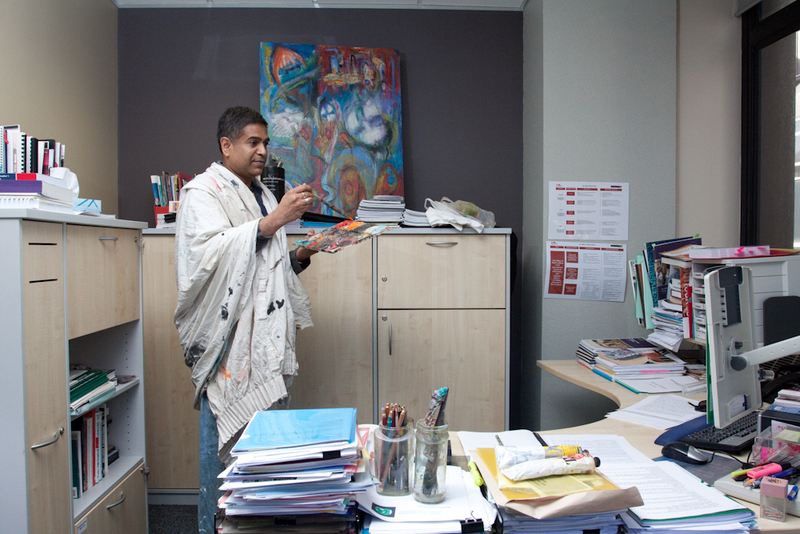 Mervin masquerade’s as the Director of The Office of Ethnic Affairs, but his true passion is expressionist and abstract painting. 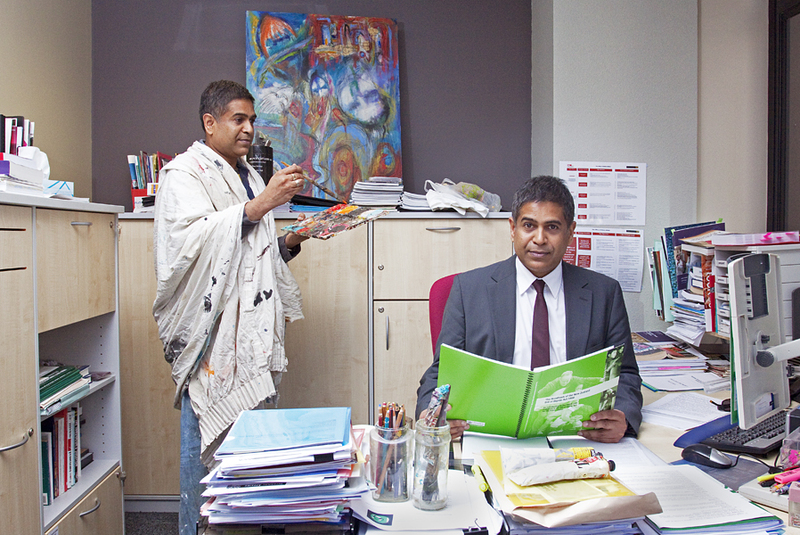 Director of The Office of Ethnic Affairs, Mervin Singham, masquerade’s as an expressionist, abstract painter during his spare time.